At 10 p.m. last night, after a long day of cooking and prep for my niece’s 2nd birthday party, I announced that I was tired and over cooking for a while. I told Brandon if he wanted breakfast this morning he would have to brave the icy road conditions to go get bagels. And then I woke up and found myself in the kitchen making muffins and a frittata. Guess I just needed a good night’s sleep to turn my attitude around! We got several inches of snow/ice in Charlotte this weekend. That pretty much means that normal life comes to a halt in the South. The roads are super icy and I was worried that the birthday party would be cancelled. They decided to go ahead and have it so I spent all of yesterday preparing the butterfly cupcakes, ham and cheddar pretzel bites and fruit skewers. Blog updates to come soon with the butterfly cupcakes and pretzel bites. Cannot wait to share the cupcakes – they came out better than I hoped and were a huge hit! I took yesterday as a rest day – the weather was terrible and I had so much cooking to do. We took Sullie for a walk this morning. 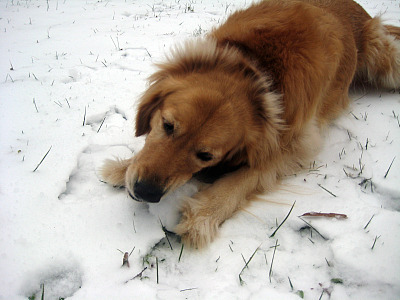 She had so much fun playing in the snow. This afternoon I went to my favorite yoga class at Charlotte Yoga. Just the best way to wrap up the weekend and get my mind ready for the week ahead. I made a lot of modifications to the Applesauce Spice muffins. The original recipe called for almost a stick and a half of butter. That just was not happening this morning! I ended up using about 4 tablespoons of butter (half a stick) and subbing 1/3 cup of plain yogurt for the rest of the butter. Also, I used half wheat flour and reduced the sugar. 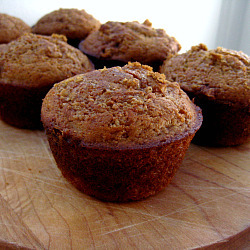 Felt much better about eating two of these delicious muffins this morning with those changes. They are tender, not too sweet and have a great apple spice flavor. A great way to mix up my normal banana muffin routine! The recipe below is my modification so check out the link below for the original recipe. Preaheat oven to 400 degrees. Prepare 12-muffin pan with cooking spray or cupcake liners. Stir together flour, baking powder, baking soda, spices and salt in a bowl. In a separate bowl, whisk together eggs, brown sugar and yogurt until well-combined. Slowly stir in butter, whisking until mixture is creamy. Stir in applesauce, then fold in flour mixture until flour is just moistened. Stir in nuts and divide batter among muffin cups. Mix together topping ingredients and sprinkle over muffins. Bake about 20 minutes, until tops are puffed and golden. Cool in pan for 5 minutes then transfer to a wire rack to cool completely. I am loving your healthy alternatives to this recipe! Just made these tonight to go with my fritta recipe for B for D! I added 1/2 cup of cooking oats and loved them!! YUM YUM! Thanks for this! LOVE the fact that they are lower calorie too! Ashley – so glad these turned out well for you. I’ve enjoyed crumbling them over my oatmeal in the morning! 🙂 Random, I know. I will have to try adding oats next time. Sounds like a great idea!